Today we celebrate the feast of St. Frances Xavier Cabrini, the founder of the Missionary Sisters of the Sacred Heart and the first American saint. 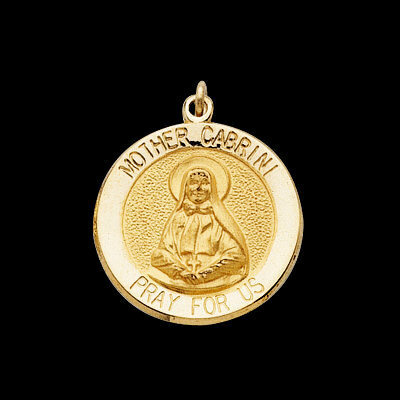 Beloved Mother Cabrini was noted for her persistence, both in prayer and in carrying to fulfillment the works of her religious Order. This quality is recommended to those who seek her aid. Despite discomfort and inconvenience, Mother Cabrini crossed the ocean twenty-five times, in furtherance of her works. (She was afraid of water though.) As a notation of this, the Little Rosary contains twenty-five beads. O my Saviour, hear Saint Frances Xavier Cabrini plead for me. Perhaps the best Mother Cabrini story is how she managed to obtain land for an orphanage in Seattle. Having been there a short time with no success, Mother Cabrini had a dream one night of a beautiful house on a hilltop. The next morning Mother and her sisters managed to hitch a ride in a limo, and when she told the receptive rich lady inside the vehicle about her dream and described the house in detail, the stunned passenger told Mother that that was her house – and despite the fact she had never planned to sell it, discerned the dream meant that she was supposed to donate it to the Missionary Sisters of the Sacred Heart. St. Frances Cabrini, pray for us!